6 – 7.30pm. Monday 4th August 2014. 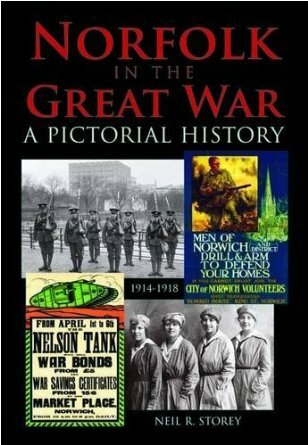 Norfolk based social and military historian Neil Storey will be giving an illustrated talk about life in Norfolk in the years leading up to the First World War and then the first few months of the conflict when there was still hope it would all be over by Christmas. After the talk which will last about an hour there will be time for questions from the audience. This is a free event but space is limited in The Curve at The Forum so please do reserve your place by calling 01603 774707 and leaving a message or by emailing Sarah on sarah.salmon@norfolk.gov.uk. Tickets will also be available to collect from the Sound and Vision Desk at the Millennium Library from Wednesday 23rd July. Neil Storey will also be in the Forum, Norwich as part of the daytime “August 4th: The Day We Went to War” event where he will be available to interpret family military photographs and memorabilia, something he has done at ‘Who do you think you are live’ at Olympia for the past four years. This entry was posted in Book, film, televsion and film reviews, Events and tagged free event, lecture, local history. Bookmark the permalink.